Having an audio restoration business where I take recordings in various formats, remove noises such as scratches and tape hiss, then make CDs of the restored audio, I wanted to be able to provide services for the widest possible selection of formats. Having acquired the ability to play back reel to reel tapes from 1-7/8 to 15 ips, on 7 and 10 inch reels; cassettes, 8-tracks, minicassettes; records from 16 to 78 rpm, lateral and vertical modulations, all equalization settings; and wire recordings, the next step was to be able to play Edison cylinder records. The following is a description of the modern cylinder player that was constructed using common hand and shop tools, not having access to a metal lathe, milling machine, or other precision fabrication equipment. Precision parts were scavenged from various equipment which was either broken or purchased at discount prices. The most expensive purchase was a linear 33/45 rpm turntable, via Ebay for around $30. The tone arm and tone arm motor control circuitry came from this turntable. The cylinder mandrel bearings were from a VCR rotary head assembly. The mandrel drive motor was removed from a computer floppy drive. The original tone arm was removed and replaced by a Technics headshell connector attached to aluminum tubing sections. The headshell and counterweight can be adjusted by telescoping into the pivot section. The tone arm has a travel of around 10 inches and slides on a linear bearing taken from a computer printer. 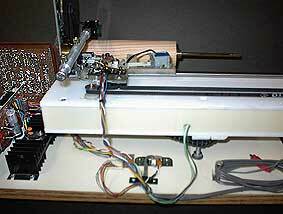 Other printer parts move the tone arm left and right using a cogged belt driven by a geared motor. The tone arm has two optical interrupters to detect when to move left or right when the stylus is in the grooves of the record. The tone arm assembly is mounted on an acrylic box made of scrap from a local plastics store. It moves up and down on three threaded rods via a motor driven chain which turns three threaded sprockets. Rear view of the player, with power supply and circuit boards for tone arm control. Rear view of the tone arm on its plastic box. Under the box can be seen the mechanism for moving it up and down. The mandrel was turned on a wood lathe from pine and does not turn absolutely true, but is close. Eventually, I want a perfect mandrel, but need either a metal lathe or enough cash to pay someone to make one for me. Or I could restore some recordings in trade for a mandrel made from plastic or metal, contact joe@precision-ar.com if interested. The first two mandrels turned were failures, this is the third attempt. The mandrel slides onto the rod and is secured by two bushings (vcr parts) with setscrews, which are attached to the mandrel ends. It had to be turned on (a friend's) wood lathe while attached to a similar rod to get it to turn (almost) true. 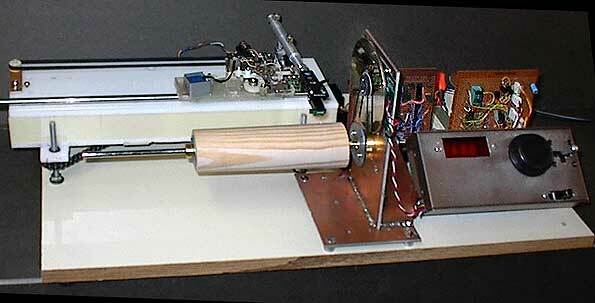 The mandrel is rotated via a belt turned by a computer floppy drive pancake motor. The crystal oscillator that originally controlled the speed of the motor was removed so that it could be varied externally. The motor would not rotate slowly enough to turn the mandrel at 40rpm, so a flywheel made from the data discs of a computer hard drive was added. The motor and mandrel mount is made from thick double-sided printed circuit board stock, cut and soldered together. The control box houses the speed display, speed control knob, tone arm control joystick, and tone arm assembly up/down switch. The motor speed control is a PLL (phase locked loop) oscillator that varies the motor speed from 40 to 199 rpm in 0.1 rpm increments. A rotary encoder drives a 3-1/2 digit up/down counter, which drives the LED display and PLL. When the tone arm is raised, the mandrel motor is turned off, and the joystick can move the tone arm left and right. The tone arm assembly can be moved up or down by the switch at the lower right. The control box can pivot 90° from horizontal to vertical, and is at 45° in the pictures. 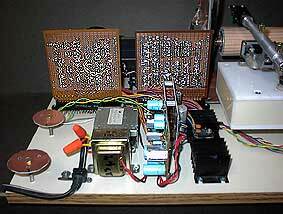 The control circuitry was built on predrilled pc boards and mounted vertically in front of the power supplies. All are mounted on a 5/8" MDF shelf board which has 4 rubber feet.